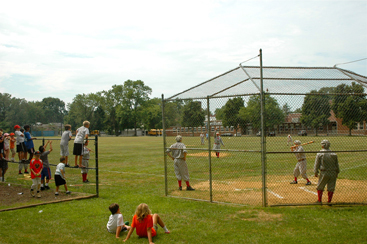 FIELD OF DREAMS: If you build it, they will come, and so they did last Saturday when the Historical Society of Princeton called for the annual reenactment of 19th century baseball at Princeton High Schools junior varsity baseball field on Valley Road. At a special joint meeting on Monday evening, members of Township Committee and Borough Council addressed two of the most contentious issues in recent Princeton history: consolidation, and the future of the Community Park Pool complex. While the Department of Education (DOE) touted Governor Christies new allocation of $17 million in new aid for New Jerseys public schools, Princeton Superintendent Judy Wilson put the numbers in perspective. With 2,000 hot dogs ready to grill and a healthy supply of slushies waiting to be mixed, Princeton Recreation and Township Police departments are gearing up for Community Night Out at Community Park Pool on August 2. Everything is free at this annual gathering, from pool admission to mini-facials and a chance to drop police officers into a dunk tank. Princeton High School (PHS) recently became the first public high school in the United States to have students participate in Operation Wallacea, an international effort that sponsors biodiversity surveys in endangered areas of the world. It has become a local rite of summer. The annual Anchor House Ride for Runaways, a fundraising bicycle trek that covers 500 miles in seven days, is familiar not only to the nearly 200 cyclists who take part, but to the countless friends, family members, and co-workers who pledge donations for the cause. To the visually oriented, Joy Cards was like a candy store. The glass cases and display racks at this Chambers Street shop were home to Joy Chen&apos;s intricately crafted, customized invitations and selected greeting cards. When she closed the store this past June, her many loyal customers were distressed. After playing three sports at West Windsor-Plainsboro High, Kristin Appelget was looking to try something new athletically when she came to the University of Notre Dame in 1989. Jason Carter is getting in the trenches to better coach the Princeton Youth Sports team this season in the Princeton Recreation Summer Mens Basketball League. It is hard to argue with the choral music of Felix Mendelssohn. Mendelssohn rediscovered and popularized the music of J.S. Bach, and his own oratorios were key in the evolution of the amateur choral society tradition and the now worldwide movement of choral festivals. Like many 19th century composers, Mendelssohn wrote works for festive town occasions, and the 1840 400th anniversary of Johannes Gutenbergs invention of the printing press (and its subsequent influence on the Protestant Reformation) gave the choral field a Festgesang  a one-movement strophic piece for brass and mens chorus  and a Lobgesang, a full choral symphony. As part of their continuing summer collaboration, Opera New Jersey (ONJ) and the New Jersey Symphony Orchestra (NJSO) brought these two pieces together (apparently a rare occurrence) last Thursday night in Richardson Auditorium. Led by conductor Mark Laycock, who has been on hand conducting Opera New Jerseys Barber of Seville, Thursday nights concert brought Mendelssohns dramatically-crafted choruses and melodic solo writing to a sold out and very appreciative house.